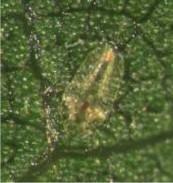 Scale insects feed on leaves or branches of many ornamental plants grown in landscapes and nurseries. They attach themselves to a plant and feed by sucking fluids through straw-like mouthparts. Although many scale species from many families can be pests of ornamental plants the primary families are armored scales (Diaspididae), soft scales (Coccidae), and felt scales (Eriococcidae). The distinction between these families is important because behavior and management of each group can be different. Armored and soft scales live beneath waxy covers that protect them from predators, parasitoids, and pesticides. Armored scales live beneath a waxy cover that is not attached to the adult body. Thus the cover can be removed to reveal the scale insect hidden below. Armored scales typically do not move once they begin to feed and do not produce honeydew. In contrast, soft scales secrete a waxy layer over themselves that cannot be separated from their body. Soft scales also excrete sugary honeydew and may move from branches to leaves during their life cycle. Black sooty mold fungus often grows on this honeydew. Felt scales have waxy filaments and resemble mealybugs. Soft scales often produce ovisacs (egg cases) that are very convex or cottony and look different than other life stages. Crawlers and second instars are small and inconspicuous and may feed on the leaves, branches, or move between the two depending on scale species and time of year. 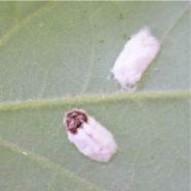 Many soft scales have nymphs that feed on leaves in the summer but move back to branches before leaf fall. Soft scales damage plants by extracting plant fluids from the phloem. This can reduce plant growth and cause leaf drop or branch dieback. The most common symptom of soft scale infestation is accumulation of honeydew and sooty mold on or beneath a plant. Heavy infestations can kill trees and are common on trees stressed by physical damage, drought, heat, or improper planting. The goal of this page is to present information common to many scale species and help identify common scales. For more information on these species use links to their individual pages. For information on other armored scales search the Extension Resource Catalog. Wax scale – There are many species of wax scale that look similar (Figure 1). The most common in our area is Indian Wax scale that infests plants such as holly, barberry, cherry laurel, boxwood and many others (Figure 2). Wax scale can be 3-8mm in diameter and are white, cream, pink, or gray. Crawlers hatch around June which is the best time for control. 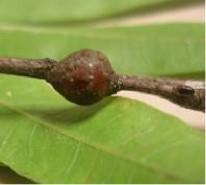 Lecanium scale – The oak lecanium scale is abundant on willow oaks and other oak species (Figure 3). European fruit lecanium is nearly identical and feeds on many deciduous trees including elm, red bud, dogwood, maples, and others. The most noticeable stage is a brown, convex, ovisac 2-4 mm across that occurs in spring (Figure 4). Crawlers emerge in late April or May, migrate to leaves for the summer and back to branches before fall. There is one generation per year. Cottony maple leaf scale – This scale occurs primarily on maples but also on dogwoods (Figure 5). It produces 3-6 mm cottony ovisacs on leaves in late spring. The brown adult females dies and remains at one end of the ovisac. There is one generation per year. Crawlers migrate from leaves to branches where they feed and overwinter. In early spring mature, mated females migrate to leaves to oviposit. Tulip tree scale – A serious pest of tulip trees and magnolias, the 6-12mm mature females can completely encrust branches (Figure 6). In late summer females give live birth to crawlers that settle on twigs and overwinter there. There is one generation per year. Tulip tree scales produce copius honeydew so leaves and surfaces below infested trees are often covered in sooty mold. 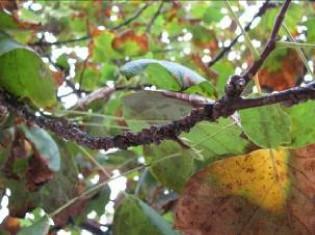 Leaf loss, branch dieback, and tree death can result from severe infestations. Figure 3. Egg case made from dried up female lecanium scale on willow oak. Figure 6. Mature female tulip tree scale covering a tulip tree branch. Honeydew is a major problem with this scale. Many soft scales produce conspicuous ovisacs in spring that are easier to scout than other life stages. Monitor soft scale populations for crawler activity. Many natural enemies help reduce soft scale abundance and damage. If evidence of predation (scales chewed open) and parasitism (circular holes in scale covers) are present you may decide to monitor the populations rather than treat with insecticides. Dormant oil applications can be made in winter to kill scale on trunks and branches. During the growing season target crawlers with horticultural oil, systemic insecticide, insect growth regulator or or other insecticide labeled specifically for soft scales. Scales can be harder to kill than other phloem feeders so just because a product is labeled for aphids, mealybugs, or other related insects does not mean it will kill soft scales. Insect and Related Pests of Flowers and Foliage Plants. Baker, J. R. ed. 1994 (revised). N.C. Cooperative Extension publication AG-136.